Cross posted on the WOISD PBL blog. The video and the summary below shows just how far students can reach in their learning if just given the opportunity to not have to go by the book. Want to learn more when you’re finished with this post? Go to the World Peace Game site. World Peace…and other 4th-grade achievements interweaves the story of John Hunter, a teacher in Charlottesville, Virginia, with his students’ participation in an exercise called the World Peace Game. The game triggers an eight-week transformation of the children from students of a neighborhood public school to citizens of the world. The film reveals how a wise, loving teacher can unleash students’ full potential. The film traces how Hunter’s unique teaching career emerges from his own diverse background. An African-American educated in the segregated schools of rural Virginia, where his mother was his 4th grade teacher, he was selected by his community to be one of seven students to integrate a previously all-white middle school. After graduation, he traveled extensively to China, Japan, and India, and his exposure to the Ghandian principles of non-violence led him to ask what he could do as a teacher to work toward a more peaceful world. Hunter teaches the concept of peace not as a utopian dream but as an attainable goal to strive for, and he provides his students with the tools for this effort. The children learn to collaborate and communicate with each other as they work to resolve the Game’s conflicts. They learn how to compromise while accommodating different perspectives and interests. Most importantly, the students discover that they share a deep and abiding interest in taking care of each other. World Peace….and other 4th-grade achievements will inspire others by documenting the unheralded work of a true peacemaker. The World Peace Game is a hands-on political simulation that gives players the opportunity to explore the connectedness of the global community through the lens of the economic, social, and environmental crises and the imminent threat of war. The goal of the game is to extricate each country from dangerous circumstances and achieve global prosperity with the least amount of military intervention. As “nation teams,” students will gain greater understanding of the critical impact of information and how it is used. As their teams venture further into this interactive social setting laced with highly charged philosophical issues, the skills needed to identify ambiguity and bias in the information they receive will be enhanced and more specifically they will rapidly perceive that reactive behavior not only provokes antagonism, it can leave them alone and isolated in the face of powerful enemies. Beliefs and values will evolve or completely unravel as they begin to experience the positive impact and windows of opportunity that emerge through effective collaboration and refined communication. In essence, as meaning is constructed out of chaos and new creative solutions are proposed, the World Peace Game players will learn to live and work comfortably at the frontiers of the unknown. Below is the recording of the panel I sat on at Tech Forum Atlanta discussing the need of social media use in schools. And, yes, I did mention Waterboy in it. Enjoy! This is an interview I did with the Tech Forum folks while I visited them in Chicago recently. Of all of the things to spend money on and be concerned about in EDUCATING our students, this is not one of them. I’m not faulting the school or the teacher. They’re only playing the game with which they are trapped in by the state. Photographs of each teacher hang nearby. Next to them are the average test scores for each of their classes, color coded in green, blue and red marker for high, average and low. Picture a super-size spreadsheet. Teachers also can get bonuses or pink slips based on how their students do. 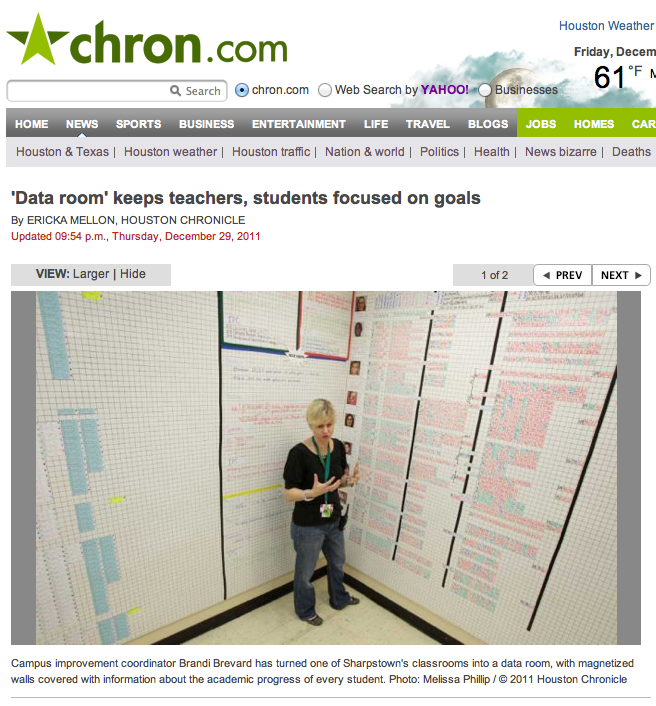 “the data room” – is the new meeting place for teachers. And the goal is to pass a test. A test that has no bearing on college success. A test that does nothing to prepare our students for the real, working world. A test that the state of Texas spends $100,000,000 (that’s 100 MILLION dollars) on each year to administer (not counting local costs) while woefully underfunding actual education and not funding enrollment growth (which grows so fast each year it’s like adding another Fort Worth ISD annually). A test that steals 25% or our school calendar to administer (not counting prep and practice days). A test that does nothing but prepare our kids to take more tests. A test that kills the love of learning in students. A test that kills the love of teaching in teachers. A test that kills innovation. A test that kills creativity. This is not what I want for my children. This is not what I want for other children. This is not what I want for our staff. At what point will the Texas Legislature realize that if they truly want to be “successful” like the world’s leader, Finland (read that link, it’s worth your time), they have to go the opposite direction. You know, the direction that includes critical thinking, problem solving, free exploration of a subject as opposed to rote memorization. The one that mandates equity among ALL students and schools. The one that focuses on building successful citizenry. What drives the learning in your classroom? And on to day three of my first PBL training experience. I will say that at this point in my training, I was thinking about how I could not believe it was already three days of training and over with. I have sat in one day trainings that seemed longer than this was. That is a testament to the work BIE is doing and the skill level of Tim Kubik. The idea here is that no one student gets trained to be the only one to know how to accomplish something in the group. At least train an additional group member in case something stops the responsible group member from completing the task. It does not hold the entire group back. It’s called collaborative work for a reason. Notice accountability does not always mean a grade. Let the students know the difference and how their ongoing accountability “scores/notes/etc” with you play into an assessment that ends up in the gradebook. This was a metaphorical game to prove the point that when one coworker gets down during the school year, we can always bring the one to bring them back to life. Adina was looking for some additional PBL resources for her own personal learning. These are worth looking into. In other words, they cannot argue their own expectations. When the parent who wants to gripe realizes it is the expectation their child helped create that he or she is failing to live up to, then they have only their child to debate with. They cannot just say that Johnny is not doing his part. They must present their side of the argument based on their contracts. What is he failing to live up to? Is it fire worthy? Can mediation solve it? As a longtime teacher of gifted students, this would be like a car accident: you know not to look, but you just can’t help yourself. This is the real meat of the entire topic summed up. Creating a culture of professional hiring and firing is absolutely real world. I believe we call that….failure. This is a pretty killer idea worth considering. You don’t think you have a day to spare in your schedule? Hmmm. Consider the time saved long term in this. Critical friends can be harsh, but it is not called lovey dovey friends. The point is that the students need to see it is okay to hear constructive, critical feedback on their project. Better to receive that BEFORE it is presented for assessment than after. The kindergarten teachers handled all of the questions like champs. I was proud to be a part of the group. This helps limit the areas the peers can go. In other words, it limits the side trips kids tend to take when they start talking. It keeps it focused and valuable. This goes back to the video about how important the First Follower can be in group dynamics. The Lone Nut is the one who puts him or herself out there. It is not until the First Follower steps out to support that person that the idea can take hold and draw many others into the fold. The video below demonstrates it perfectly, but just know that PBL is is the Lone Nut worth following. Your kids deserve it. Your career deserves it. You can be part of the epic success of the student, or you can be the one the kids remember as the teacher who was a worksheet master. Your choice. I have absolutely no idea how I got off track in posting the second and third day of my reflections from my PBL training with the Buck Institute for Education via Twitter on my training. I apologize to my mom and the other person who clicked on the link in Google after a search for PBL. Let me get back to completing the two days before something else gets in the way. Again, since it has been so long, I am posting what I said on Twitter during the training and adding a short reflection as needed to show what I was thinking or what I wanted to better understand. It might not be the best way to reflect, but it’s my blog, so what the heck. If you haven’t seen the RSA Animate video Drive, you really should. Like now. This was mentioned at the beginning of the day to let us know what to expect. I really like this method of review and it helped me prepare mentally for the end of the day expectation. In other words, I didn’t want to get caught in the fishbowl with nothing to say. That’s not very productive as a learner, for sure. This tweet was retweeted a bunch of times, and deservedly so. It was a great line by our trainer. Gives you something to think about, and I know every time I use the word grade now, I have to pause to make sure it is what I meant. Assessment is a much more meaningful word. It is also a much more meaningful process. Keep that in mind. The fist to five was new to me and most assuredly an easy one to utilize to immediately assess each student’s comfort level with the current topic. Basically, hold up the number of fingers on how you feel you are doing with the concept being discussed (you choose what number means great or not at all). You can quickly average/estimate the scores to decide if you move on as a whole group or a small group. Exit tickets lets students share their opinion on post it notes or similar on the way out the door, at the end of the project, at the end of a lesson, etc. I like this part. One thing you need to make sure of, though, is that you get enough grades in they system to show the student’s actual progress. Can you really show a true average with only four or five grades per six weeks? Does it give the student and parent something to use to help the student growth? I’d say it depends on the topic(s) covered. If it is one topic covered in all of those grades, then probably so. If different topics, then most assuredly not. This is great to keep in mind when CREATING the assessment tool(s) for the project. Don’t slap down a one size fits all rubric and force the kids to adjust their learning to your personal thoughts. That truly kills the point of PBL. What you have done at that point is just turn it into a project. Anybody can do that at a low functioning level. Yeah, I know many of you think QR codes are stupid and a time waster, but it is a new technology that these teachers are trying out. I love the fact that they are stepping outside the box here to tie in something different. Besides, QR codes are a way of life for many marketers, fitness devices (parks use QR codes to give instructions on outdoor equipment), and information links in general. Folks should be familiar with them. See my notes before. Maybe it is the fact that someone gave me an expectation of learning at the beginning of learning. Maybe it is the fact that I find myself excited about learning in general now. Regardless, I love the transparent process that the fish bowl activity provides. It invites anyone to be a part of the conversation…or not. Yet, we all learn from the conversation that is inherently a part of it. Ooooo. Burnnnnn. In other words, don’t just go download a project off the web and think everything falls into place easily. It doesn’t. You have to consider many angles of where the students can take the learning. It is more time intensive in the beginning, but it pays much larger dividends in the end for you and the students. Wow!. All I can say here is, Wow!